We present an amazingly beautiful range of pearl earrings that are made using colorful and exotic array of pearls in variety of designs. A stunning range of studded earrings are offered by us in various unmatched designs studded with precious or semi precious stones. The exquisite range comes in various shapes and sizes, that is easy to wear and maintain. These studded earrings are as per the contemporary trends and patterns and is best suited for all age groups. Ideal to worn with matching ethnic wear, the dangling pair looks amazing in different finishes. We test our product range on the quality of gemstones, finishing and polishing and can also provide customization as per the specifications given by client. 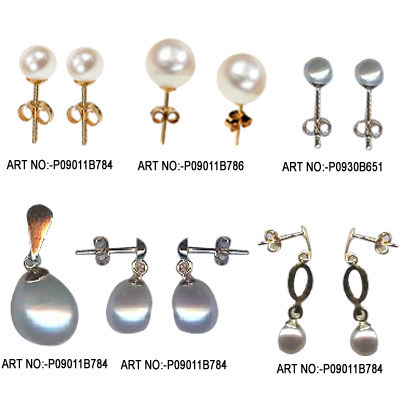 We offer an unmatched variety of artistic and exclusive fashion earrings. We offer a simple yet exquisite range of swarovski earrings that are artistic and exclusive and exhibit ultimate finish. We manufacture and export an unmatched collection of ear studs in ethnic and modern designs and at industry leading prices. These earrings are offered in several stones of various shapes, sizes and colors.